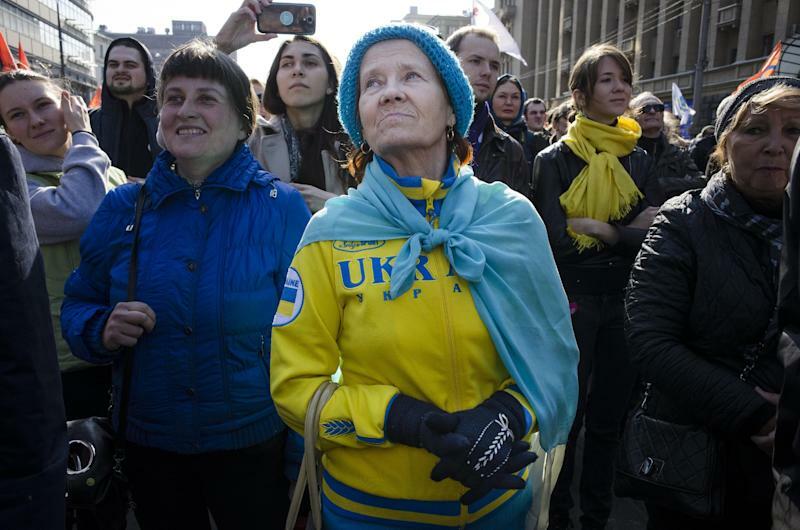 MOSCOW (AP) — More than 10,000 people turned out in Moscow on Sunday for an anti-Kremlin rally to denounce Russian state television's news coverage, particularly of the crisis in neighboring Ukraine. In promoting the Kremlin line, state television has portrayed the new pro-Western government in Ukraine as a "fascist junta" under the control of the U.S. government and determined to oppress Russian speakers in eastern Ukraine. The broadcasts have taken on a harsh anti-American tone. 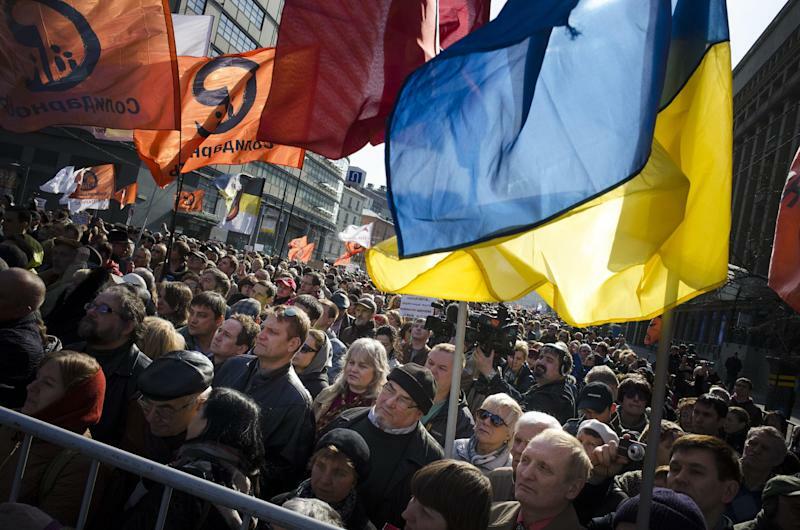 Some of those who took part in the demonstration, called a "March of Truth," carried blue and yellow Ukrainian flags. 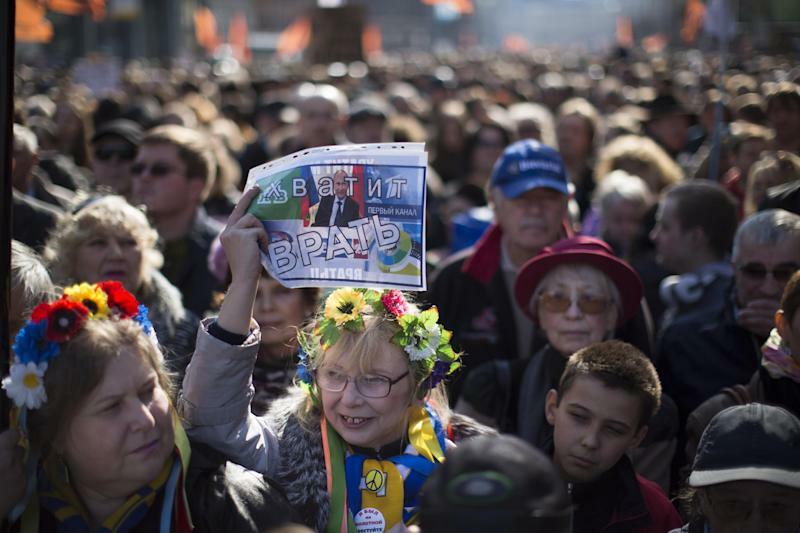 One woman, wearing a traditional Ukrainian wreath of flowers on her head, held up a sign with President Vladimir Putin's picture and the words: "Stop lying." Among those who spoke to the crowd was Andrei Zubov, a history professor who was fired from one of Moscow's most prestigious universities last month after criticizing Russia's military intervention in Ukraine's Crimean Peninsula. Zubov argued against the annexation of Crimea by comparing it with Nazi Germany's annexation of Austria on the eve of World War II. Zubov told the crowd that by lying to the Russian people on television, the government was leading the country toward "an abyss." The U.S. and Ukrainian governments have accused Russia of orchestrating the unrest in eastern Ukraine in an effort to split the country. Russia has denied any involvement.